There are various methods of training horses, and everyone has his own ideas on the subject. No doubt in some parts of England it would be impossible to take a youngster for walks across country, because you could not get over the thick thorn fences on foot ; but Ireland is eminently adapted for this sort of work, as the banks and ditches are generally jumpable for an active person. The young horses that illustrate this article belong to a dealer who hunts them all and races them at local meetings if they are fast enough. 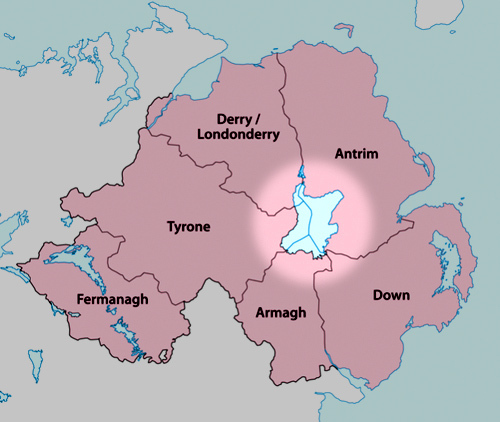 Most of them are home-bred, and they run wild over a big stretch of land on the shores of Lough Neagh  until they are three and sometimes four years old. Then two trained horses are ridden up to the lake and a herd of seven or eight youngsters driven back to the farm, where they occupy big roomy boxes, and the training begins. There is never much trouble with them. 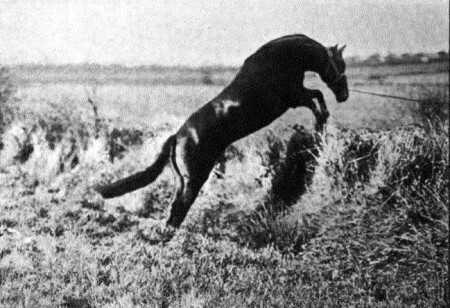 Sometimes they object to the cavesson : the black horse, for instance, lay down when he first had it on, tore up the earth with his teeth, and squealed with temper ; but after they have been thrown once or twice they generally let you do anything you like with them, and in three or four days the boys are riding them. I can imagine people who take a fortnight to drive them in long reins asking “What about their mouths ?” Wonderful to relate, they turn out as a rule with fairly good mouths and manners. Of course at first they are ridden on a straight bar-bit, and I know no better bridle for a “green ‘un” than a rein which is all one with the martingale,  and runs through the snaffle ring, the other rein fastened as usual on the snaffle. It requires hands, certainly ; but with this bridle you can oblige a horse to carry his head in the right place, he cannot bolt, and you can make it unpleasant for him if he kicks, bucks, or rears. I like a horse to have plenty of character (if it is not of the wrong sort) ; but one has to be very careful with young ones, for they are only too ready to pick up bad tricks, if they are not firmly but kindly dealt with. Horses, like ourselves, have temperaments of their own, and what is good treatment for one might ruin another ; a sulky brute who refuses through sheer temper and obstinacy is all the better for one real good thrashing ― of course after all other means of persuasion have been tried ; but then there is a vast difference between a refuser of this sort and one who declines a fence from nervousness and lack of confidence. 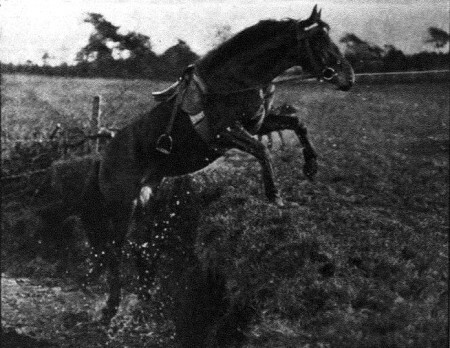 Here, I think, lies the whole secret of giving them a taste for jumping: only send them over small places they can manage easily without being frightened, let them take their own time, never touch them with a whip, pat and make much of them when they have done well, and it is wonderful how quickly they take to the business. 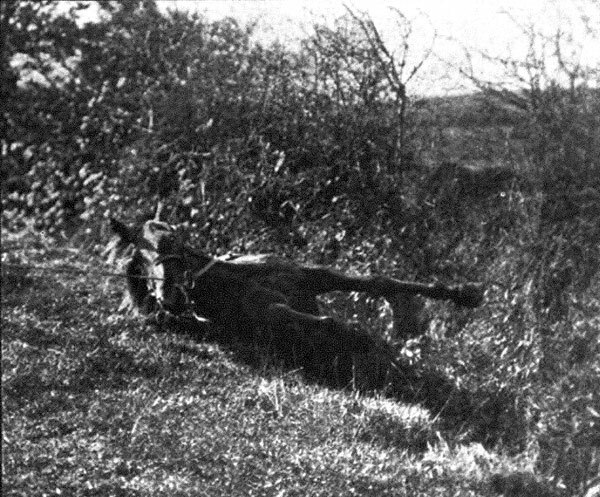 A colt will watch you choose your place in a fence, and is often so keen to be over after you that he hardly gives his pilot time to land safely first. 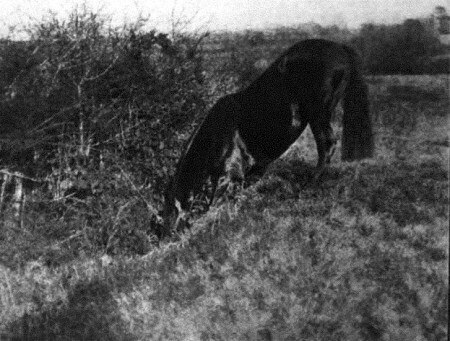 A young horse does not apparently depend on his sight alone for judgement ; at the first few fences he likes to put down his nose and smell, more especially if they are little open ditches ; having snorted loudly, he jerks up his head and backs away, only to return full of curiosity and go through the same process again ; then, having made up his mind that he will have to go over, he bends his knees as though he were going to prostrate himself devoutly (his instinct is to bend his knees), and remains in that position, not quite realising the next move ; finally he springs off and gives a tremendous jump over a two-foot drain. My rage at not having a plate left can be imagined ! The next day we had two thoroughbreds out, but they declined to fall, although they flew the banks, and were not what you might term careful jumpers. A farmer then came out and joined us with a “useful” three-year-old. 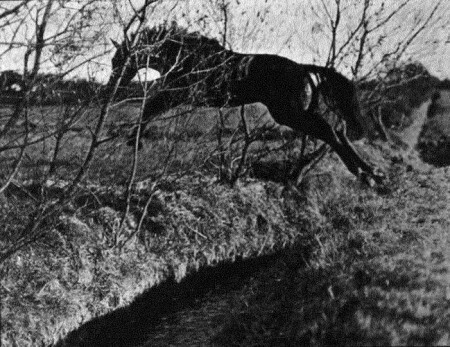 One photograph shows her jumping out of a river bed, and, of course, the moment after I had released the shutter she fell and rolled over into the field, her hind legs having slipped back over the edge of the bank ; fortunately (for me) she fell again over a bank and rolled into the ditch. A horse nearly always falls on the landing side, unless it be a case of coming over backwards; but there are no high stone-faced banks in county Antrim ; the fences are all small, trappy, and often rotten, generally with ditches on one or both sides, and hedges on the top of the banks. It takes a really clever horse to do them neatly. I know that out with the various hounds in this county I have seen more falls in one day than you would see in a whole season in the south of Ireland where the fences are larger. 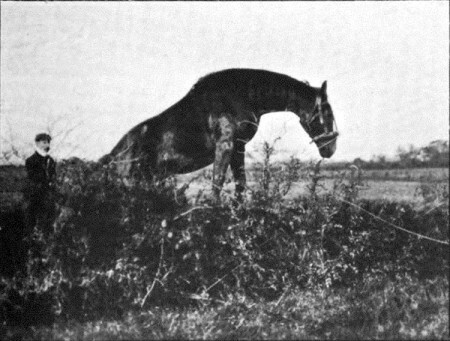 The natural position of a horse’s head when he rises at a fence is down near his knees ; when he is landing he throws it up and the weight back. If you will take the trouble to jump a fence carrying some weight on your back, as I frequently do with my heavy camera, you would at once realise the difference it makes to your balance, and it illustrates the feeling the horse must have with a bad rider in the saddle. I think the only time to use your hands at a fence is in making your steed take off at the right moment, and in giving any necessary support on landing; when actually jumping horses’ heads should be perfectly free. 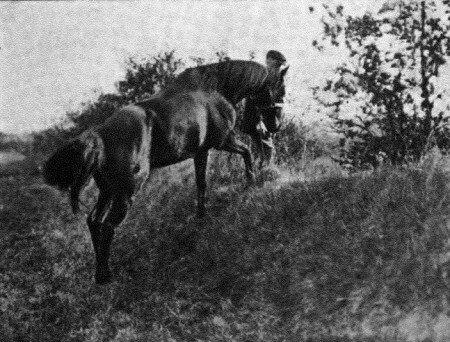 A youngster does not know when to take off at first, as these illustrations show plainly ; in one the colt went into the ditch and jumped out of it ; another time he used his nose as an extra leg, and got right under the fence. When a horse makes a mistake or falls, his nose often plays a prominent part in the programme. Horses are as intelligent as you care to make them ; they can be taught anything ; only most people do not train them properly, and leave them shut up in the stable the best part of twenty-four hours. It is just as interesting to take your horses for a walk as it is to take out your dogs, and much better for the horse than standing idle in his stall, even if he has been exercised already. The more he is in the society of a sympathising owner, the better chance he has of developing his intelligence. I am sure that a young horse adopts the character of the person who rides him, in many ways; a bold rider will make a flippant fencer, a cautious man a sticky one, and everybody knows how instantaneously a nervous person communicates his thoughts to a horse, even although the rider may not appear nervous to the onlooker. I think hunters are treated much too artificially. A certain dealer in England turns his young hunters out every night, even in snow, all through the winter; they have a covered shed in the field, get as much oats as they can eat, and he never has a cold or cough in his stable. Of course they are not clipped, but they are more hardy and fit than their more pampered brethren. Without going to those extremes, however, it is always easy to see that windows are kept open day and night, especially with young horses off grass. Some grooms are fearfully obstinate in trying to keep fresh air out, and the simplest plan is to break all the window panes; that generally settles the question. 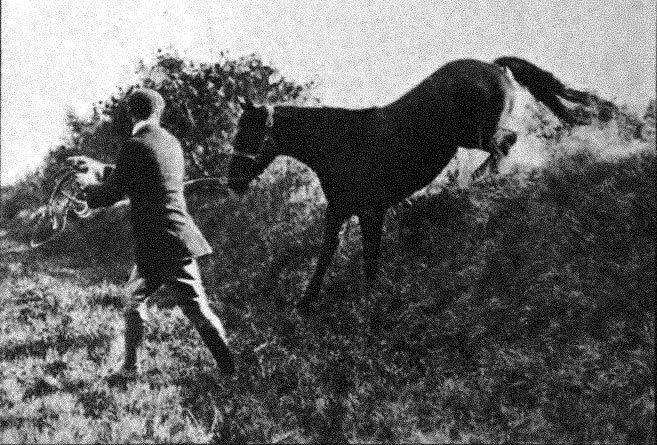 Everyone who has made young horses will realise the interest of the work, and the honest pride one feels when one’s pupils do one and themselves credit in the hunting field. 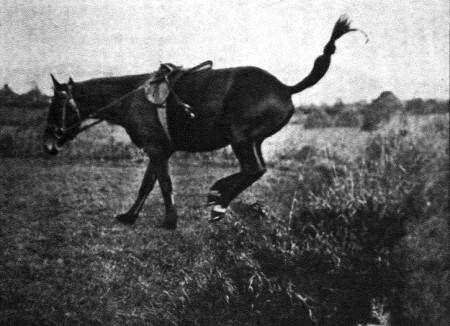 Then as soon as they are really a pleasure to ride, they change hands― the best of friends must part― and you begin all over again on the next lanky rough- haired colt, who with a few months’ good feeding, grooming, and work, will not be recognisable as the same animal. Lough Neagh: Is the largest lake in Northern Ireland. 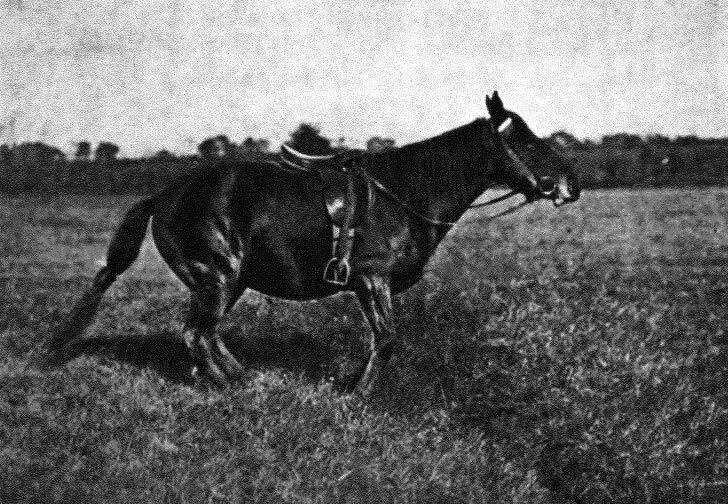 Martingale: A martingale is a piece of equestrian tack equipment designed to control a horse’s head carriage. There are three main types of martingales: the standing, the running, and the German martingale. Snaffle: Snaffle or Snaffle Bit is used while riding horses. Three photos included in the original article were not available.